"Dear mother! Don't be afraid, as Allah Almighty is the sole protector. We are aware of the difficulties we endure while walking on this holy path. Never wail or get sorrowful if I get killed while in quest for Allah's blessings, this sort of death is the most valuable among other deaths." SAN FRANCISCO: Ever since the television - more appropriately known as "idiot box" forced its way into homes it has been a constant source of heated debates. The link between watching violence on television and violent behavior in everyday life has been an open question - embraced by the advocates of TV, rejected by another and more often left unanswered by many. But a new class of scientist and psychiatrists say that the correlation between violence on televion and violent behavior is no longer a point of debate, it is an established fact. A new study released last week in the Journal Science suggested some sort of connection. The study tracked the impact of'idiot box' on violence among more than 700 young people over 17 years. The study first of its kind in more than fifty years shows that adults are affected as surely as children. Adolescent who watched more than one hour a day of television - regardless of what they are watching - were roughly four time more like to commit aggressive acts toward people later in their lives than those who watched less than an hour of those who watched more than three hours, 28.8 percent were later involved in assaults, robberies, fights and other aggressive behaviour. Of the group that watched less than an hour of TV a day, 5.7 percent had committed a violent act that resulted in serious injury, such as broken bone. Among those who watched one to three hour, 18.4 percent had been violent. Of those who watched more than three hours a day, the rate of aggression was 25.3 percent. GAZA: Deadly spates of suicide bombings by valiant Palestinian Mujahideen ripped malevolent Zionists who are engaged in the worst atrocities and genocide against the innocent and courageous nation. 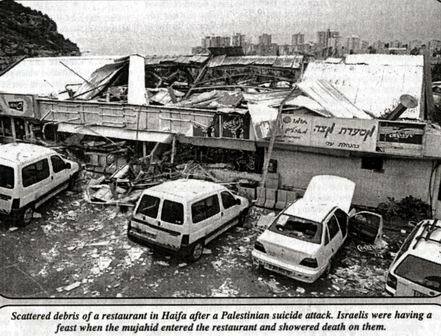 In the most deadliest and effective attack, 27 people were killed and nearly 170 wounded when a Palestinian fidayee mujahid blew himself up in the dining room of a Netanya hotel when more than 300 guests were sitting down for the Jewish festival, Pessah. Almost everybody inside was either killed or wounded in the blast, which destroyed the ground floor of the west wing of the seaside hotel. Hamas claimed the responsibility for the massive suicide bombing, releasing the details of the shaheed as mujahid "Abdul Bassit Odeh, 25, a member of its military wing, Izzadin Kassam, from the Nur-e-Shams refugee camp outside Tulkarm. Bank town of Ramallah. "We will continue the mhrtyrdom attacks on Israel until the full withdrawal from Palestinian territory," Hammas announced over mosque loudspeakers in the West Bank refugee camp of Jenin. The mujahid who carried out the bombing is Shaadi Tubassi, 23, from the Jenin refugee camp in the northern West Bank, a Hammas statement told. The explosion was so powerful that it blew out large parts of the roof of the provisional structure. In a separate riposte, Five illegal Jewish settlers were killed and three wounded, all members of the same family, when a mujahid barged the hilltop settlement near Nablus, burst into their home, and shot them. This attack was also carried out by Hammas Islamic Mujahideen. In another unprecedented reprisal, an 18-year-old female Palestinian suicide bomber, wearing a belt of explosives around her waist, walked into a supermarket in a Jerusalem neighborhood on Friday afternoon and blew herself up, killing seven malevolent Zionists and wounding 34 others. The Al-Aqsa Martyrs Brigade took responsibility for the attack and identified the bomber as Ayat Akhras from the Dehaishe refugee camp near Bethlehem. As the news of the attack reached the martyr's Dehaishe refugee camp, residents celebrated by handing out candy, firing guns into the air and offering Salaat-e-Shukr (thanksgiving prayers). wounded when a suicide bomber detonated explosives outside the emergency medical center in an illegal Jewish settlement of Gush Etzion on Saturday. Al-Aqsa Martyrs Brigade claimed responsibility for the attack and identified the shaheed mujahid as Jamal Khameid, 17, of Bethlehem. On Friday, two Israelis were killed in an attack when Palestinians attacked them in the central Gaza Strip illegal Jewish settlement of Netzarim. The freedom fighters apparently broke into a synagogue during early morning prayers and began stabbing worshippers, reports said. Later the attackers managed to escape safely, reports added. Palestinian mujahid group Islamic Jihad on Friday claimed an attack in which two elderly Israelis were stabbed to death at a Jewish settlement in the Gaza Strip. "Muhammad Ahmad Khazzik, 22, from the Al-Sabra neighborhood in Gaza City carried out the heroic and courageous assault," another Palestinian organization, AI-Quds Martyrs Brigades said in a statement received in Beirut. The statement said Khazzik "assaulted the Netzarim settlement south of the city of Gaza and attacked a group of Zionist settlers, killing two of them and wounded four others, according to the enemy." The group urged "all its fighters across the land for a general mobilization and a confrontation by all means against the savage Zionist aggression against our unarmed . people." KUWAIT/KANU: Kuwait's elected parliament, in a rare criticism of the country's close ally the United States, on Monday urged Washington to end its "contribution" to Israeli aggression in the Middle East. The parliament urged Washington to show fairness when dealing with the Israelis and Palestinians. In a statement sent to news agencies, the parliament, the only such elected Gulf Arab Assembly, called on the United States "to adopt a policy based on rights, justice and international charters and (UN) resolutions instead of its current policy which contributes to the continuation of the Israeli aggression." Kuwait's Islamist groups had earlier issued a stronger statement, urging Arabs to withdraw their collective peace offer to Israel announced at an- Arab summit in Beirut on Thursday. The influential groups said Arabs must aid Palestinians in "their Jihad-the only option before the nation to confront repeated Zionist aggression". Thousands of Kuwaitis took to the streets on Saturday in a show of support for the Palestinians. But there were also massive chants against Israel's ally the United States, which led the 1991 Gulf War that ended seven-months of Iraqi occupation of Kuwait. Despite a rift with Arafat for appearing to side with Iraq during the Gulf crisis, Kuwait has come out strongly against the Israeli operation, describing it as an insult to all Arabs. Information Minister Sheikh Ahmad al-Fahd al-Sabah also vowed full support for Arafat in a telephone conversation with the Palestinian leader. ignores the massacres of Palestinians," their statement said. Kuwait, home to 400,000 Palestinians prior to the 1990 Iraqi invasion and the birthplace of Arafat's Fatah movement, has no links with Israel. Moreover, Nigerian Foreign Minister Sule Lamido said on Monday in a statement that the Israeli government is engaged in "terrorism" in its campaign against the Palestinian leadership. Israel should accept the peace plan put forward last week by Saudi Arabia and withdraw to the borders it maintained before the 1967 Arab-Israeli war, Lamido told reporters here. "The way (Israeli Prime Minister Ariel) Sharon is pursuing the Middle East crisis may not yield the desired peace," said Lamido, in the strongest remarks yet made by a representative of the Nigerian government. "The recent destruction and occupation of (Palestinian leader Yasir) Arafat's residence in Ramallah is a clear case of state terrorism," Lamido said. "The only solution to the crisis is for Sharon to adopt the Saudi Arabian proposal which demands the total withdrawal of Israel from Palestinian territories and the restoration of diplomatic ties with Israel by Arab countries," he said. "Simply because Israel is well armed, it comes to the official residence of the political leader and demolishes it, slaughters his bodyguards and holds him captive," said Lamido. "You humiliate him after taking away from him everything that makes him feel a dignified person. Taking away his authority and his humanity is really bad," he added. Nigeria maintains diplomatic relations with Israel despite strong support for the Palestinian cause, particularly among the majority Muslim population in the north of the country. Three major demonstrations against Israel have been held in the past year in northern Nigeria. TOKYO: A Japanese campaigner for Palestinian rights committed suicide by setting himself on fire in a Tokyo park to protest the Israeli security clampdown in the Middle East, a fellow activist said Monday. group "Voice," frequently participated in hunger strikes and candlelight vigils in support of the Palestinian cause, said Adachi. After firefighters extinguished the flames, they asked Himori if the bums were self-inflicted, Adachi said, quoting a police report shown to family members. "He nodded in assent, and died." A number of Japanese activist groups held rallies on Saturday, celebrated by Palestinians as "Land Day," to protest Israel's crackdown on Palestinian leader Yasir Arafat. Several Japanese ultra-leftist groups carried out terrorist attacks in support of Palestinian liberation during the 1970s. 'Abdul Hameed or former John Walker Lindh and illegally denied him access to an attorney after • he was captured with Taliban mujahideen in Afghanistan. Lindh's lawyers have said the California man was fastened to a stretcher with duct tape and kept naked in a freezing metal box before he made several allegedly incriminating statements to the FBI in mid-December. acknowledged that his clothes were taken and he was secured to a stretcher after arriving at the American-run "Camp Rhino." But they asserted that Lindh, who is charged with conspiring to kill Americans abroad and assisting terrorist organizations, was properly treated as a potentially dangerous detainee." The defense team has asked for FBI notes, detailed information about U.S. troop movements in Afghanistan, the identities of CIA and other confidential witnesses and e-mails among Justice Department officials about Lindh after the Califomian was captured in northern Afghanistan. media, as each side tries to shape public perception of 'Abdul Hameed or former John Walker Lindh, who could get life in prison if convicted. Justice Department officials declined to comment yesterday. On Friday, defense filings also made clear how much of this case is distorted on the three interviews 'Abdul Hameed gave to the FBI in Afghanistan without a lawyer present. "The bulk of the evidence in this case comes from US military spokesman not from the person himself," the defense lawyers wrote. Defense lawyers are seeking to have the statements thrown out because, they assert, Lindh made them after being tortured and being denied access to Brosnahan or any other lawyer for more than a month in custody. GROZNY: Russian barbarianism against the innocent Chechen citizens continued unhindered despite recently announced restraint actions by the Kremlin. The commander of the Russian occupation forces in Chechnya signed a decree aimed at ending widespread human rights abuses by soldiers against Chechen civilians. Lieutenant General Vladimir Moltenskoi said that from now on officers involved in the so-called "special operations" have been ordered to identify themselves when entering homes. But despite such announcements, our correspondent reports Russian troops took dozens of people, including youth hostages in Tsatsan-Yurt and Vedeno areas of the occupied republic. According to local media reports, the village of Tsatsan-Yurt was besieged on Wednesday, with male population taken to unknown concentration camps. Reports from Vedono district confirm feud between pro-Russia militants and the FSB. According to local population, Russian troops arrested pro-Russia activists from the area when they challenged FSB's actions, including looting of civilian belongings and arson. Tensions rocketed soon after mobs of pro-Russia militants agitated. Meanwhile, Chechen freedom fighters carried out attacks against the Russian occupational forces throughout the republic, killing thirteen troops and injuring more than 30. In Shali district, a Russian military jeep was destroyed in a blast when it hit a landmine, reports said, killing all four troops in the vehicle. In Johar city, the Chechen soldiers attacked Russian positions, killing eight soldiers and wounding 18 more. A Russian armored vehicle was also destroyed in the attack. A Russian military commandant of Argun city was killed in an ambush with the freedom fighters. More details of the attack were not available. Two other armored vehicles (BTR) were destroyed during deadly raids conducted by the Chechen Mujahideen in Gudermes region. One armored carrier was also destroyed in Iliskhan-Yurt village near Gudermes area. Local population claimed more than seven Russians were killed and eleven injured in the guerrilla raids. A wave of revolt is sweeping through Russia's military elite as troops refuse to act as "cannon fodder" in the continuing Russian offensive in Chechnya. Outraged by poor pay, incompetent commanders and antiquated weaponry, a growing number of soldiers from specially trained Interior Ministry units (FSB) are threatening to disobey orders to serve in the breakaway republic. In the latest case of open insubordination, members of an elite paramilitary squad from the northern city of Cherepovets have given their superiors until next week to heed their demands. published across a whole page of Komsomolskaya Pravda, a national' newspaper, on Friday, ridiculed Moscow bureaucrats for claiming that there is no war in Chechnya, and just a "counter-terrorist operation" is underway. Their protest came to light on the same day Russia released figures showing that 3,220 soldiers have been killed and nearly 9,000 injured in two and a half years of fighting in Chechnya. The Cherepovets soldiers' defiance is only the most recent example of a collapse in morale among Interior Ministry troops - professionals, unlike the conscripts serving in the army -ordered to deploy to the North Caucasus. Units from Syktykvar, Kaliningrad, Murmansk and Vologda, all cities in Russia's north or northwest, have all protested at the length and conditions of their tours of duty in Chechnya so far this year. Among their grievances are efforts by their commanders to cut their bonuses for being involved in combat. The Cherepovets ultimatum goes further, heaping scorn on "Moscow clerks", the officers commanding operations in the region and corrupt pro-Russian Chechen officials. Troops posted to Chechnya had to take their food, water and bedding with them at supplies were "pitiful", the Cherepovets unit said. Russia maintains an 80,000-strong force in Chechnya to assert its occupation over the war zone' but a shortage of combat-ready units has put severe strain on the military. BEIRUT- Saudi Crown Prince Abdullah, said on Monday before departing for Damascus that the Arab world was waiting to see concrete action from the United States to stop the Israeli assault on Palestinian President Yasser Arafat. "We are doing our best to solve the present crisis. We have contacted our friends in the US and they have made promises and we are awaiting concrete steps based on these promises," the Arab News quoted the crown prince as saying while talking to the reported at the airport. "The Israeli people have not opposed the peace plan," he said in reference to the Saudi-initiated peace proposal adopted at the Arab summit. "The Arabs have offered Israel an olive branch. Now the ball is in the Israeli court." Prince Abdullah highlighted the Kingdom's efforts during the past 60 years to convince the United States to take a just and balanced stand on the Palestinian issue. "We asked the US to stop the Israeli aggression and they made promises," he added. Calling his disagreement with the US over Washington's biased stand on the Palestinian issue a "thing of the past," the crown prince expressed his hope that US President George W. Bush would do the needful to end the current standoff. Palestine and Arafat is their leader. We strongly believe that justice will prevail in the end," he said. Asked about Israel's plan to drive out Arafat from Palestine, the crown prince reiterated that regardless of whether Arafat was expelled, the Palestinian resistance would continue. "Every Palestinian is a Yasser Arafat," he added. He described the Israeli assault on Arafat, which came a day after the Arab League adopted a peace plan offering normal ties with Israel, as "brutal, inhuman and insane," the paper added. AHMADABAD: Hours after Chief Minister Narendra Modi claimed in Mumbai on Saturday that Gujarat was returning to normal, violence broke out in many parts of the state late in the night claiming at least nine lives. The incidents come four days prior to Prime Minister Vajpayee's scheduled visit to the state amid frantic attempts by the government to show a semblance of normal functioning. The toll in the riots and violence in the state since February 28 has risen to 800. Violence has claimed 325 lives in Ahmadabad alone. The most vicious clashes were reported in the labor-dominated Gomtipur in which at least three persons were killed and 18 injured. There were reports that at least two persons were still missing in Gomtipur and this could trigger more violence on Sunday evening. In the Gomtipur area of Ahmadabad, violence was reported from 10 pm onwards and the frenzy continued till well past midnight when Army columns were called in. Heavy stone-throwing, firing and arson were reported from the area. Miscreants also set ablaze houses and shops in Samsherbagh on Nagri Mill Road and other areas like Mohanlal ni Chawl, Jhulta Minara, Sutharwada and Hauz Wali Masjid. Numbed with pain, Asif Ali sits cross legged on the ground with his badly burned son in his arms, a blank, uncomprehending emptiness in his gaze. His wife and two other children were thrown into a fire by a Hindu mob and burned alive before his eyes. His baby son, who has not uttered a sound since his mother, brother and sister were lulled, was burned too - his little limbs and body are scarred with weeping wounds. The two are sheltering with about 4,500 other terrified Muslims in the Shah Alam Mosque in Ahmadabad. "I will not leave this place", says Asif, "we will be killed." Every hour more Muslim refugees arrive in the mosque compound. They have come from far and wide, aware that this is one of the few places around Ahmadabad that offers some safety. There are scant medical facilities and little food and water, and no one has visited to bring help from the local authority. "We have been abandoned ... abandoned to die," said one man who had lost four members of his family to the rampaging mob. The tales of mediaeval atrocity are almost too chilling to believe, remarked a BBC correspondent visiting the chaotic area. The heaving bustle of merchant life, which was replaced by scenes of barbarity and mayhem is gone, it is now eerily quiet. Small groups of khaki clad soldiers stand on street comers. Nearby, men from the Rapid Action Force in their unmistakable blue camouflage uniforms lean on their rifles and lathi sticks. But the Muslim community says their arrival after-rioting flared on Thursday was anything but rapid. The shutters on some shops on the fringes of the worst affected areas are starting to come down but others will never re-open. 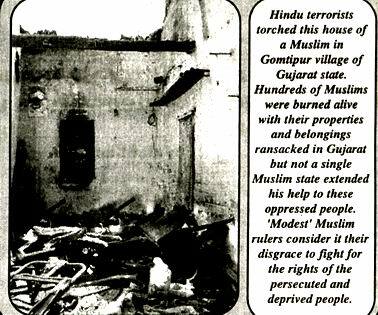 Premises owned by Muslims or bearing Muslim names were clinically singled out for destruction. A row of shops in the town centre is intact except for one, which is blackened and destroyed - it was a shoe shop managed by a Muslim family. They are gone and they have nothing to come back to, their premises looted and then douced in petrol and destroyed. RAMALLAH: This is a true account of what happened to Maha Sbitani, an American living next door to Arafat's compound in Ramallah. "Today at 5:00 a.m. I was awaked by what sounded like huge trucks. When I looked out the window I saw several tanks. A half hour later, the Israeli soldiers rang the bell. We did not answer. Then I heard them coming up the steps (obviously broke in the main door). They pounded on the door to the house, and my husband opened the door to find endless huge guns pointed at us. They pushed the door open and distributed themselves throughout the house and office." Over SO heavily armed soldiers were now in the office and home (which are adjacent). We asked what they wanted and they told us to shut up and sit down. I explained that I was American, they said that they did not care what I was. I insisted that they leave the house and told them as an American, I protest to what -they are doing. The Israelis said "this in no worse than what your country is doing in Afghanistan". I told them to use the steps and the roof if they insist on staying and to get out of the house and office. They said, "shut up and sit down, we do what we want wherever we want." cigarettes out in instead of the floor. One took the ashtray from me and threw it in the hallway. At that point, I realized they are out of control. I went to the phone to call the American Counsel. Three soldiers attacked me, one pushing, one twisting my arm and the other taking the phone away from me. I went to the office to get my computer and they kept on pushing me, poking me with the guns and telling me to get back in the house. I started screaming, "I cannot believe you are doing this, don't you realize I am American?!" The commanding officer asked them to leave me alone and gave permission for me to get my laptop. They started laughing and calling me [US President George W] Bush. As I was getting my laptop I heard crashing noise, I ran to the house and found my husband on the floor with 3 guns pointed at him. I screamed for the commanding officer that came and pushed them away. They were everywhere and doing what they felt like doing - including urinating on th floor. I went to the kitchen to get coffee and found olive oil spilled all over the place. They were just being vulgar and uncivilized and became extremely annoyed when I complained about the barbaric behavior. The commanding officer took me in my bedroom where 4 soldiers were sitting and asked me about some buildings to which they intended to launch an attack. I told him that most of the houses around us are full of children. One said, "Area A has no children." That number of tanks is growing by' the second. I have to get the message to you while I can. I will try to write later. They are trying to kill Palestinians and [Palestinian leader] Yasser Arafat. I can see it from my window. I will try to send the film clips that I have been able to capture. God help the innocent. And help Americans in seeing the truth. FRANKFURT: Thousands of people joined traditional Easter weekend antiwar protests which wound up across Germany on Monday, their numbers swollen by concern with the Middle East crisis and the US-led "war on terrorism." Organizers said the turnout was the highest in a decade in a sign that "a new anti-war movement is forming itself," in a statement issued on Monday. On Monday, 5,000 people turned out in the northern city of Hamburg and 4,000 peace activists took to the streets in Frankfurt, they said. Several thousand more marched in Berlin, joined by several groups of Palestinians who shouted pro-Palestinian and anti-Israeli slogans as the protest moved past the US embassy in the capital. at the Berlin march, where a key theme was opposition to US-led threats to take military action against Iraq. "We want to show that not all Germans are for war," a 54-year-old Berlin woman said. Monday's demonstrations came after malevolent Israeli Prime Minister Ariel Sharon declared that Israel was at war and said Palestinian leader Yasir Arafat was an enemy of the free world. "Palestine must live, fight the occupation" and "Sharon, murderer", shouted marchers in Berlin. The marches took on a special significance this year with German troops taking offensive action in Afghanistan for the first time since World War II, and worries the US-led war on terrorism will soon expand with a strike against Iraq. Anti-war marches took place throughout the four-day Easter weekend in around 70 German cities and towns. ZAMBOANGA: A salvage crew has recovered the bodies of four of the 10 American soldiers whose MH-47 helicopter crashed into central Philippines seas last month, a local military spokesman said on Saturday. "The Philippine navy has confirmed the recovery of the four bodies," said Colonel Michael Manquiquis. He declined to give further details. Manquiquis said the Philippine navy was assisting a team of US soldiers and civilian contractors to recover the bodies and the wreckage of the helicopter that went down off the island of Negros on February 22 with the loss of all 10 American military personnel on board. Local television station ABS-CBN reported in Manila that the recovery team was trying to find the three remaining missing bodies before it tried to raise the wreckage of the gunned down helicopter. The helicopter was on its way to its temporary base in Cebu island when it went down. It had just flown to the southern island of Basilan where it dropped off a US Special Forces team to "train, advise and assist" Filipino forces going after the Abu Sayyaf, a Muslim guerrilla group. US operations in Philippines began under the pretext that pro-independence Muslim organization, Abu-Sayyaf Front has suspected ties with the Usama bin Laden's Al-Qaida network. JERUSALEM - A Saudi Arabian newspaper editor last Thursday issued a backhanded apology for a column published last week which resurrected the medieval blood libel against Jews by claiming they use the blood of Christian or Muslim "mature adolescents" to prepare special Purim pastries. AI-Riyadh editor-in-chief Turki al-Sudairi wrote that the article, wHtteiTb/ Umayma Ahmad al-Jalahma of King Faisal University, was "not fit to prim." The paper had been sharply criticized by the US government before Al-Riyadh published the apology, reported Jerusalem Post. wants to annihilate the Palestinians are something else and completely different." In the article, which was translated into English and disseminated by the Middle East Media Research Institute, al-Jalahma wrote: "During the Purim holiday, the Jew must prepare very special pastries, the filling of which is not only costly and rare - it cannot be found at all on the local and international markets, Unfortunately, this filling cannot be left out, or substituted with any alternative serving the same purpose. For this holiday, the Jewish people must obtain human blood so that their clerics can prepare the holiday pastries. In other words, the practice cannot be carried out as required if human blood is not spilled! ", the Post said. It is worth mentioning here that Antonia Bonfin a 15th century Hungarian churchman had also pointed out such rites involving the blood of Christians during his time. He had said: "The traditions of their ancestors tell them that the blood of a Christian is an excellent balm for healing the wound produced by circumcision. They are obliged, by virtue of an ancient and secret commandment, to offer yearly sacrifice with Christian blood and their owns......". ST. LOUIS: The United States reeling from the naughtiness of their Christian clergy had hardly taken a sigh of relief after two months of sexual scandals that rocked the country, the prosecutors here said on Friday that they are investigating about SO new complaints of child sexual abuse, including up to 22 against a defrocked priest who worked as a school counselor. The complaints follow a public appeal by Circuit Attorney Jennifer Joyce's office last week for information about possible cases of sexual abuse by current or former Roman Catholic priests. A leading newspaper here repotted that the defrocked Catholic priest, who worked as a counselor until last week, was charged today with three counts of sexual misconduct in exposing himself to two boys in an elementary school bathroom, authorities said. Joyce said that, along with those charges, up to 19 other sexual abuse complaints against James Beine, 60, are under investigation. As many as 30 additional complaints were received about several other priests and people _not _involved with the church, reported ihe Washington Post. Beine was dismissed from the clergy in 1977 and later faced accusations that he sexually molested nine boys while working as a priest in two area parishes, the Post added. He was arrested in Highland, Illionis., about 30 miles east of St. Louis, and was jailed on $100,000 bond. The accusations are the latest of several to roil the church in Missouri. On Wednesday, the Archdiocese of St. Louis announced the resignation of one priest and placed another on leave. Last week, the city's schools suspended Beine after learning the church had spent $110,000 to settle two lawsuits accusing him of sexually abusing boys while he was a priest. RAMLA: As the Sharon government prepares for the next round of military assaults in the 1967 occupied territories, the Palestinian population, including refugees, local and international NGOs as well as the United Nations are still tallying the costs of Israel's brutal war on the camps that began at the end of February and was suspended three weeks later. During the three-week assault Israeli military forces killed nearly 200 Palestinians, amounting to more than IS percent of the total number of Palestinians killed since the beginning of the Al-Aqsa Intifada in September 2000. Israel's military assault also exacted a heavy toll in damage, destruction and looting. In 'Aida refugee camp in the Bethlehem area, for example, according to analysis of a survey completed by the PLO Department for Refugee Affairs, 36 percent of the refugees were directly affected by the assault, including deaths, injuries, damage to housing and cars, reported Ummahnews in its online edition. It said in the initial assessments by UNRWA indicate that around 1,800 refugee shelters were damaged during Israel's three-week military assault in March. In Jenin camp in the northern West Bank, for example, nearly one-quarter of the total number of refugee shelters in the camp were damaged. The total number of refugee shelters destroyed by the Israeli military (141 shelters) during the three-week assault represents nearly half the total number of shelters destroyed in the Gaza Strip in the last 18 months since the uprising began. Israel's military assault also resulted in damage to 22 schools, four health clinics, two ambulances and four camp service centers .in addition to roads, alleyways and other infrastructure in the camps. Israeli and Palestinian newspapers have carried reports of widespread vandalism and looting by Israeli soldiers, reminiscent of 1948. This includes stolen money and jewellery, use of telephones for longdistance calls, senseless destruction of household items, and hate-filled graffiti. BEIRUT: Iraq has received public backing from other Arab states after it promised to respect the independence and sovereignty of Kuwait, which it invaded in/1990. Iraq's pledge was contained in the final communique from the Arab League summit in Beirut, which also called for both sides to work to resolve disputes over prisoners of war. Arab leaders in response urged an end to UN sanctions against Baghdad and rejected any new military campaign against. Saddam Hussein's regime - an indirect reference to recent US threats. In an immediate reaction, a State Department spokesman said Washington was "profoundly skepcical" of the agreement reached between Kuwait and Iraq. and kissing Iraqi delegation head Ezzat Ibrahim. Mr Ibrahim said his country respected the security of Kuwait and that his government hoped that such overtures would secure outright support against US threats. Iraq has been engaged in a strenuous effort to try to improve ties with the rest of the Arab world, a diplomatic offensive given added urgency following President Bush's condemnation of Baghdad as pan of the "axis of evil." Iraq's announcement shows it is seriously trying to build support among the Arab world to help prevent any American-led military action. Washington has accused Iraq of developing weapons of mass destruction and insists that Baghdad allow United Nations weapons inspectors back into the country. Perplexed, US State Department spokesman Richard Boucher expressed pessimism over reports that Baghdad would respect Kuwaiti sovereignty. "If true, that would be good, but Iraq has never evidenced any real intent, to respect Kuwaiti sovereignty. It has a deplorable record of flouting its international obligations and UN Security Council resolutions," he said. The Beirut Declaration welcomes "Iraq's confirmation to respect the independence, sovereignty and security of the state of Kuwait and guarantee its safety and unity to avoid anything that might cause a repetition of what happened in 1990." According to the BBC, though the deal does not resolve all the disputes between Kuwait and Iraq, it is a starting point for doing so. But it is highly significant, he says, a solemn Iraqi undertaking endorsed by all the Arab states. Speaking on his return to Kuwait City, Kuwaiti Foreign Minister Sheikh Sabah al-Ahmad al-Sabah said he was completely satisfied with the agreement with Iraq, agencies reported. OCCUPIED AL-QUDS/RIYADH: Three legal workers from China were taken by ambulance to Hasharon Hospital for emergency medical treatment last Wednesday after being badly beaten with iron rods and planks. to leave the country before their work contracts expired. The handler filed a counter-complaint against the workers but refused to tell his version, reported Jerusalem Post. Meanwhile a Chinese dentist, who arrived in Saudi Arabia four months ago and employed at a health clinic in Taif, has embraced Islam, reported Arab News quoting the Al-Jazirah as saying. The doctor said he began taking interest in Islam soon on arrival. OCCUPIED AL-QUDS: As the current Intifadah has entered in its 18th month, the monster of Sharon's terrorism is taking its toll. With every new day as the casualties continue to mount in the occupied lands so is the mental behavior of the Jews. Thousands of fake doctors taking the advantage of their prime minister's inhuman policies are reported to open psychotherapy institutes in Israel. Even someone without any training whatsoever, can offer psychological therapy or counseling and charge an exorbitant high fee for it. therapists and about 10,000 social workers, rehabilitative therapists, educational counselors, geriatric care workers and others. Yet, according to the legal interpretation accepted by the Justice Ministry, the activity of these people - who provide counseling without being clinical psychologists or psychiatrists constitutes a violation of the psychologists' law. According to this interpretation, many of the therapists who violate the law do so in the context of public and governmental service, including in the Health Ministry itself: for example, social workers employed as mental health officers in the Israel Defense Force, social workers in the Prison Service, and psychiatric nurses in the state health system. LYON: A group of masked assailants smashed two vehicles into a synagogue in the southeastern French city of Lyon, causing considerable damage in an attack which bore the hallmarks of anti-Semitism, police and eyewitnesses said Saturday. An eyewitness to the attack, which occurred just after midnight Friday at a synagogue in the suburb of Ducheres, said the attackers ranged between 10 and IS, wearing face-masks. Alain Jakubowicz, a lawyer and the head of a regional Jewish body in the southeastern Rhone-Alpes region, said the incident was "one of these attacks carried out in our country against the Jewish community." part of the facade and smashing a large window. A group of between 120 and 180 people later protested outside Lyon's central government building against the attack. Marcel Dreyfus, a local Jewish community leader, said the prefectoral authorities had agreed to step up security outside all the synagogues in the region as a result of the attack. In its statement, MRAP made a connection between the attack and the current situation in the Middle East, saying that whatever the policy of the Israeli government, "all the Jews in France cannot be held responsible." Lyon and its environs are home to an estimated 50,000 Jews, many of whom moved to the region when they had to leave France's former North African colonies in the 1960's. BOSNIA: THE HAGUE: UN Dutch peace-keeping troops posted in the Bosnian town of Srebrenica in 1995 failed to take actions that could have prevented the massacre of some 7,000 Muslim men and women by Serb forces, and notably ignored a Serb officer requesting them to oversee an evacuation, a church group said Thursday. The Hague is seeking to indict Mladic for his role in the "ethnic cleansing" of Bosnian Muslims. The group said that this allowed the Bosnian Serb forces to set up their own evacuation of women and children, and then to kill around 7,000 Muslim men and boys in what was the worst single massacre in Europe since World War II. Publication of the report comes days before the Dutch Institute of War Documentation (NIOD) is due to come out with its own report on the massacre, which has caused considerable soul-searching in The Netherlands due to the presence of the Dutch troops. "The Dutch never took measures to defend the Muslims; even though they promised to..do so," said Mient-Jan Faber of the IKV.